In the words of George Bernard Shaw, 'We don't stop playing because we grow old; we grow old because we stop playing'. Truly said, playing is the quintessential activity that should be followed all through your life. During the early age, a person needs to involve into playing games and other activities not only for his physical development, but also for the emotional, social and personality development. Kids of 21st century are now more involved in spending time in front of the television, computer or playing video games. This has led to lethargy and other adverse health related symptoms in kids of a very young age. Every school premise has a playground or an open ground with all the equipment that helps a kid experience the fun of playing games outdoors. But actually how helpful is an outdoor playground for kids? 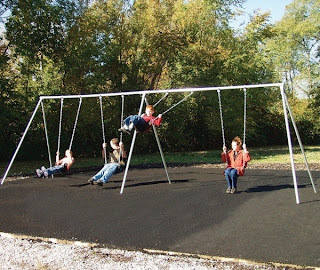 Playground fosters a sense of companionship and instills a sense of team spirit among children. Outdoor activities help children to become agile and develop their motor and sensory skills. Promotes spiritual, moral and character development. Playing also develop health, cooperation and self-confidence of children. Kids learn relationship building, self-control, negotiation and tolerance. Removes tiredness, laziness, and promotes creativity, focus and concentration. Physical exercises build up strong muscles and bones. All these advantages are provided by playing outdoors. However, the only challenge is to get the kids on the playground. For such a problem, many parents have to push their kids to get involved into playing games outdoors. Therefore, manufacturers have created effective and alluring equipment for both normal and physically challenged kids to play and grow themselves. Playground for kids include slides, swings, climbers, bench swings, sandboxes and sand diggers, spring riders, and more. The equipment is available at competitive prices and of superior quality for fun filled and developmental activities to be played by kids on the playground.